Learn the ancient art of Ukrainian Easter Egg decorating-- a sacred and meditative practice. We’ll be using natural materials to decorate our pysanky including locally-sourced free range eggs, beeswax candles, and natural dyes (plant and animal based dyes). This beautiful tradition has its roots in the home, making it the perfect activity to share with family and friends. Learn to paint in the folk-style of Petrykivka- renowned and internationally recognized as an intangible cultural treasure. Enjoy a delectable feast with traditional Ukrainian dishes, and scrumptious imaginings, prepared by Folk Camp chef Lizzy Shipman and her team, featuring seasonal local ingredients sourced with love and care. Join the Kosa Koliadnyky in singing traditional Ukrainian koliadky (carols), and come dressed in your best festive folkwear to partake in the fun. After the singing and feasting, the zabava (party) will kick off with Korinya: Ukrainian Folk Band playing traditional dance tunes from Ukraine and Poland, and dancer Stephania Woloshyn providing the guided instruction. Fun, accessible, easy dances everybody can participate in, raffle, snacks, and door prizes, will keep everyone having a good time til the early morn. We hope you and your kin will join us! All proceeds from the evening will go directly to Folk Camp Canada, a not-for-profit organization that provides accessible community programming in the folk arts, with particular attention to the cultural traditions of Ukraine & Eastern Europe. FCC runs educational programs ("Folk School"), summer Folk Camp, as well as several folk music and dance events throughout southern Ontario. Supported by: Rosewood Winery & Meadery Beau's All Natural Brewing Co. Learn to sing old Ukrainian & Eastern European folk songs in traditional "village voice" polyphony and experience the beauty of ancestral song w. Marichka Marczyk. Learn how to make a "didukh", a sheaf of grain traditionally prepared by Ukrainians (and many European nations) as a way of honouring and bringing the ancestors to the table during the holiday season. ("Didukh literally means "grandfather" in Ukrainian). We’ll be working with local wheat and some rye, and colourful yarns to make beautiful centrepieces. To register and to get the address of the workshop, email us at folkschoolworkshops@gmail.com. Limited spaces available. Learn to sing old Ukrainian & Eastern European folk songs in traditional "village voice" polyphony and experience the beauty of ancestral song with Marichka Marczyk. Join us for an intimate house concert with Yuriy Fedynsky featuring a special presentation of traditional instruments, along with sing-along masterclass, with group jamming-music making. Ukrainian-American composer, torbanist, bandurist and singer-songwriter, producer, bandleader, luthier, cultural activist and pedagogue. Fedynsky moved to the small vilalge of Kryachkivka (population 500) to work on resurrecting the almost lost tradition of "dumy", lyrical ballads by blind Ukrainian musicians. Fedynsky is a performer on kobza, torban and traditional bandura. Please email olenka.kleban@gmail.com for address & other information. Join Jurij Fedynskyj -traditional instrument maker and kobzar (bard in the ancient Ukrainian tradition), for an evening house concert, as he stops for one night in the Ottawa Valley, upon his trail as he crosses North America "Kobzaring the New World". Jurij is a dedicated kobzar, carrying the tradition of dumy (the ancient Ukrainian epics) with reverence, bringing them to the public with musical skill and deep knowledge of the lineage. Originally from North Carolina, Jurij lives in Ukraine, where he teaches the construction and playing of traditional Ukrainian stringed instruments in a small village in the Poltava region. He's spent the past fifteen years in Ukraine, researching the original bandura, kobza, and torban, and is one of only a handful of makers who create professional-quality instruments based on historical examples in Ukrainian museums, and is the only player who regularly performs on all three instruments. He'll be sharing the old epics, telling stories and singing folk songs from Kryachkivka, as well as presenting the various traditional instruments that he's built, a rarity in our times and an absolute rarity in these lands. Concert will begin promptly at 7pm. Please do not be late! Learn to make a traditional Ukrainian embroidered blouse! 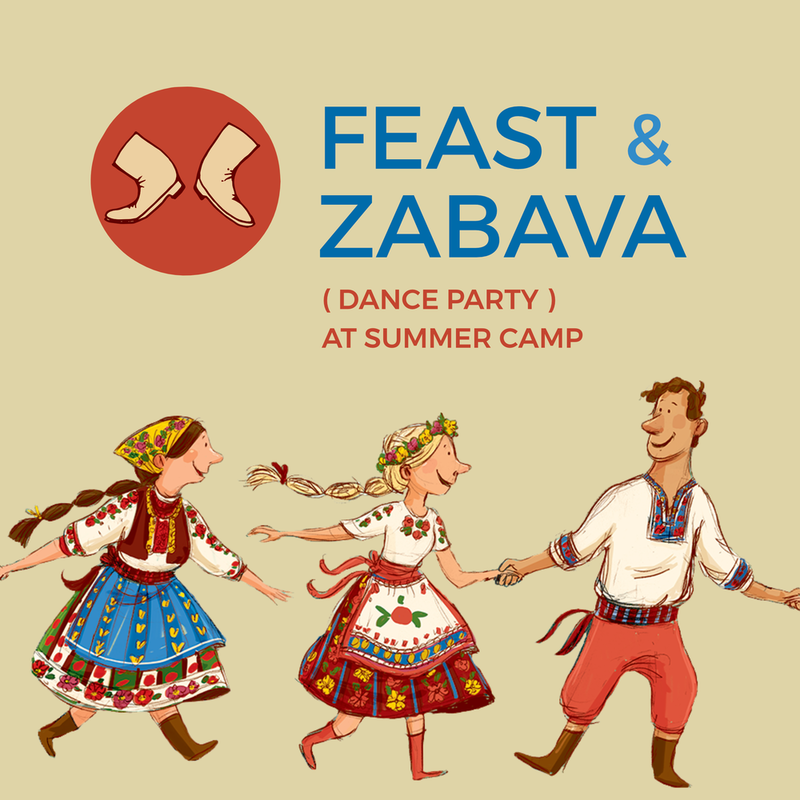 Join us for a Feast & Zabava (Dance party) at summer camp on Fri. August 24, 2017. We are hosting an evening of traditional Eastern European feasting and celebrating with toasting ,singing, and live music. Folk tunes and dances led by our Folk Camp Band and special guests Csángó Unchained from Toronto. You must RSVP by emailing us at folkcanada@gmail.com to attend. Folk Camp's SUMMER CAMP is a week long immersion into folk culture in which participants experience the traditions of craft, song, dance, theatre, and food from our heritage through workshops and various activities. Burdon’s repertoire is mostly based on traditional music from Ukraine and the mysterious Carpathian region, the crossroads of Romania, Hungary and Poland. Their spirited live performances combines an age-old tunes with modern arrangements, Nordic influences with Balkan grooves which altogether paint a vivid, dramatic world full of excitement, love, mystic and enchantment. In 2015 the band won the main prize “Eiserner Eversteiner” of 24th annual international competition “FolkHerbst” in Germany. Musicians still experimenting with new instruments, new sounds and beautiful Ukrainian songs that form the basis of their music. Blisk is a synthesis of polyphonic Eastern European and Balkan song, dance and movement backed by hypnotic percussion. Experience a musical journey travelling through Ukraine, Poland, Macedonia, Serbia and beyond. Based in Toronto, the members of the group hail from Canada, Ukraine, Poland and Kazakhstan and were brought together by a deep love and respect for these ancient songs and dances, bringing the tunes to life in the modern world. They made their public debut in December 2017 at the Aga Khan Museum opening for JUNO-nominated Turkwaz. They performed at the Toronto Ukrainian Festival, Sofar Sounds Toronto and the Global Toronto Conference. Love of flowers and adornment carries across cultures, and is a beloved aspect of Ukrainian folk culture. Come and make some folk flowers! Learn to make a sculptural (three dimensional) beaded flower under the expert guidance of Ivanka Krysa-Bodnar of Gerdan Toronto. The perfect folk accessory-- brooch, hair, or wrist adornment. Fun European Folk Dance Night featuring Polish, Ukrainian, Hungarian and Latvian dance tunes. No experience necessary! Come join the fun. Participants will learn to make a bracelet and matching earrings using the technique known as "RAW" - right angle weave. Learn how to make beautiful Pysanky: Easter eggs in the traditional Ukrainian style! Learn the ancient spring practice of Pysanka: Ukrainian Easter Egg using Natural Dyes! Participants will learn how to make beautiful Pysanky: Easter eggs in the traditional Ukrainian style. Wow your friends with your skills and beautiful creations!